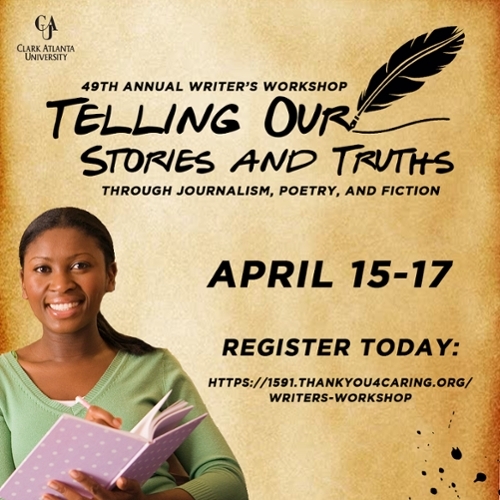 ATLANTA, GA – April 11, 2019 – Clark Atlanta University today announced that the Department of English and Modern Languages will be hosting the 49th Annual Writers Workshop Conference, April 15-18. Themed “Telling Stories and Truths through Poetry, Fiction, and Nonfiction,” the conference introduces critically acclaimed writers and offers writing workshops to the University’s student body, faculty, staff, and surrounding communities. The CAU Writers’ Workshop Conference has previously brought such literary dignitaries to campus as Ruby Dee and Ossie Davis, Mari Evans, J. California Cooper, Tina McElroy Ansa, Elizabeth Nunez, and Tananarive Due. This year’s event features authors Tina McElroy Ansa, Valerie Boyd, Leonard Pitts, Angela Tuck, Charles Jones, and Curtis Bunn. Professors and guest speakers will facilitate creative writing and poetry workshops, and an Open Mic Poetry Slam. For more information, please contact Georgene Bess Montgomery at gmontgomery@cau.edu or 404.880.6109, or Mary Jackson at mjackson@cau.edu or 404.880.6733. Established in 1988 by the consolidation of Atlanta University (1865) and Clark College (1869), Clark Atlanta University (CAU) is one of the Nation’s foremost research institutions, offering students from around the United States and several foreign countries the opportunity to engage in 38 exciting areas of study at bachelors, masters and doctoral levels. Located in the historic heart of Atlanta, one of the world's great international cities, CAU’s nearly 4,000 students enjoy access to academic and co-curricular experiences, from forensic debate, to on-air broadcasting, to cancer research with world-renowned investigators. From the arts to zoology, CAU combines nearly 300 years of tradition with a solid focus on academic excellence to produce leaders who will shape the future of the global community. To learn more about Clark Atlanta University, visit www.cau.edu .